I told you there would be posts other than I Read It First! Alright, so it’s not Monday, but sometimes Drunk Movie Monday just happens on Thursdays, okay? And this is one of those weeks, because it’s a new year, and thus we have a brand-new opportunity to get drunk watching bad films. So why not start off with a really bad one? The premise: …do you remember Air Bud? And the whole monstrosity that was that series of sport-playing Golden Retrievers? And how it’s totally terrible and the only amazing thing about it is that the concept didn’t get scrapped immediately? Well, turns out there’s a spin-off series. The buddies series, starring five adorable golden retriever pups, who cover all of the more obscure sports that couldn’t make it to the Air Bud franchise. One of those sports is mushing–ironically, the only sport actually designed for dogs. 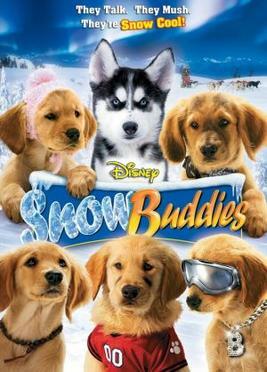 Snow Buddies follows B-Dawg, Buddha, Budderball, Mudbud, and Rosebud, five precocious pups with one-dimensional personalities and lots of CGI, as they accidentally ship themselves to a small town in Alaska, where they meet up with husky pup Shasta and become part of his mushing team. The movie is powered almost entirely by incompetent adult humans failing to do their jobs, and fart jokes. And there are puppies in it. Who talk. WHAT COULD POSSIBLY GO WRONG? Why you should watch it: Aside from the abundance of adorable talking dogs, this is a movie worth watching out of sheer incredulity. How did it ever get made? Who bank-rolled this crap? And how did they ever convince the mom from Dead Like Me to accept a bit-part in it? Do they really think “likes mud” is an entire personality? Is it racist to give the Alaskan husky a Native American accent? And how many fart jokes can fit in one children’s made-for-TV movie, anyway? I’m sure more questions will occur to you as you watch this film. I know I had a lot. Most of all, the question I kept coming back to was, do I have any more wine? The drinking game: Drink for unnecessary CGI dog lip movement. Twice if you can tell where the dog’s trainer was standing just out of frame. Bonus: Do a shot for heteronormativity. Then seek medical care. Where it’s available: Netflix, which is where I stumbled upon both it and all of its sport-playing-puppies brethren. I don’t know how deep this rabbit hole goes, but I’m sure someday I’ll be bored enough to find out.